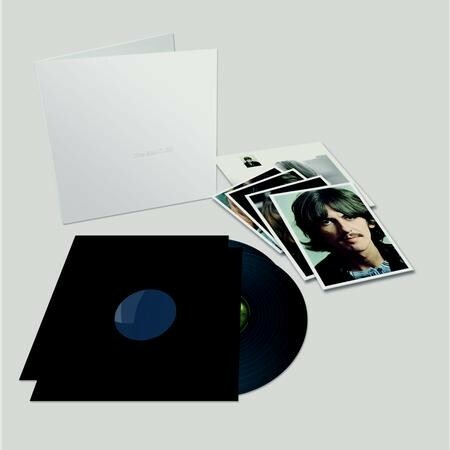 The White Album 180-gram 2LP new stereo mix! Rolling Stone 500 Greatest Albums of All Time — rated 10/500! "'Happiness is a Warm Gun' and 'Martha My Dear' sounded fully present and accounted for. When the band fell in on '...take a good look around you' it gave me shivers! Get it." — Sasha Matson, Stereophile.com, Nov. 11, 2018. Read the entire review here. Exactly 50 years since this Beatles' self-titled LP first appeared (it went on to become better known by its unofficial name, due to its plain white cover), the Fab Four are serving up an anniversary reissue, complete with new mixes and previously unheard demos and session recordings. The famous album's 30 tracks are newly mixed by producer Giles Martin, son of original album producer George Martin, and mix engineer Sam Okell in stereo and 5.1 surround audio, sourced directly from the original 4-track and 8-track session tapes. The White Album — originally intended to be called The Beatles, but got its nickname thanks to the all white cover — has a lot of hits on it. "Back in the USSR," "While My Guitar Gently Weeps," "Helter Skelter," and "Revolution 1" are just the tip of the iceberg. Every track is someone's favorite, from "Savoy Truffle" to "Dear Prudence." "We had left Sgt. Pepper's band to play in his sunny Elysian Fields and were now striding out in new directions without a map," says Paul McCartney in his written introduction for the new White Album release. Presented here in its 2LP standard vinyl configuration, this anniversary reissue was plated and pressed at Quality Record Pressings. It features pull-out reproductions of the original album's four glossy color portrait photographs of John Lennon, Paul McCartney, George Harrison, and Ringo Starr, as well as a lyric sheet and poster. The White Album was the first Beatles album to be released on the group's own Apple Records label. Issued in both stereo and mono for the U.K. and in stereo for the U.S., the double album was an immediate bestseller, entering the British chart at number one and remaining there for eight of the 22 weeks it was listed. The White Album also debuted at number one on the U.S. chart, holding the top spot for nine weeks of its initial 65-week chart run. In the U.S., The White Album is 19-times platinum-certified by the RIAA and in 2000, it was inducted into the Recording Academy's Grammy Hall of Fame, recognizing "recordings of lasting qualitative or historical significance."